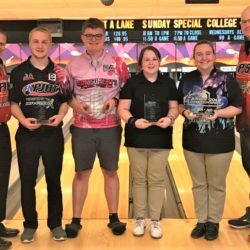 The PJBT continued its 20th Anniversary Season with a return trip to Hiester Lanes in Reading, PA for a 21 & Under Doubles Event. This event saw 44 doubles teams (88 Bowlers) competing on St Patty’s Day 2019. The lane pattern for the event was Kegel Recreational Easy Street. Easy was the key word! The day saw multiple honor scores and some amazing bowling by our 88 athletes. In Scratch, Daniel Althouse & Isaac Erickson captured the doubles title. They led the 18 team scratch field wire-to-wire for the day. Althouse started the high scores of the day with an early perfect 300 Game during qualifying. He ended up being 1 of 4 perfect games on the day. Althouse/Erickson shot scratch team games during qualifying of 519, 443, 526, 511, and 433 for 2432 (+432) for 5 games. They led the field into Round 2 of qualifying. Round 1 8th place cut was +177. Althouse/Erickson shot 435, 483, and 500 to finish 8 games of qualifying at +650! They were the tournament leaders entering our baker format stepladder final. In the title match, they took on #3 seed Kolby Bennett & Aidan D’Souza. In an exciting title match, Althouse/Erickson defeated Bennett/DSouza 256-210 to take home the title. Althouse/Erickson each won a $200 scholarship ($400 total) and the awards from Crown Trophy for their win. In Handicap, Madison Balliet & Sarah Fenicle found the luck of the Irish! Balliet/Fenicle entered the event with a team average of 222 and 160 pins handicap per game. They shot scratch team games of 219, 272, 269, 279, and 281. After 5 games, they had shot 2120 (+120) and was seeded 4th out of 26 teams entering Round 2. Round 2 saw them shoot team games of 251, 264, and 286. After 8 games, they shot 3401 or +201. Balliet/Fenicle were seeded 3rd entering the stepladder finals. Balliet/Fenicle had to win 3 stepladder matches to win….and that is what they did! They entered the finals in the quarterfinal match vs #4 seed Cole Reigel/Tevon Kerr. In a close match, they squeaked out a win 183-173. Onto the semi-final match vs #2 seed Joey Buck/Jessica Hollabaugh. This match was also close but Balliet/Fenicle outlasted Buck/Hollabaugh 168-142. This advanced them to the title match to take on tournament leaders Rebecca Breidegan & Desmond Brown. This title match was entertaining. The key shot was late by Desmond Brown, where he threw a perfect shot and stoned an 8 pin. The spare rather than strike set them back and Balliet/Fenicle never looked back. Balliet/Fenicle won the title match 231-203 in route to victory. The PJBT would also like to congratulate 4 bowlers on rolling perfect 300 Games on the day. All bowlers were in the 300 Pot and took home $53 each. All four of them split $212. First, Daniel Althouse shot the first perfection of the day in route to a title win. Next, Francis Vitelli shot a perfect game during qualifying. Him and his partner, Brian Kennedy, finished 3rd in the event. Next, a handicap participant, Anthony Damone, shot a perfect 300 Game. Anthony’s team finished 12th in Handicap. Finally, Brandon Updike shot a perfect game. His team of Updike and David Swavely just missed the finals….finishing 6th in Scratch. Congrats to all our honor bowlers for the day! Next week: The PJBT returns to Suburban Bowlerama in York, PA, for our 5th Adult Junior Event of the Season. As of the time of this post, the 60 team field is SOLD OUT! Sunday March 24th at 10:30am. We will see everyone then!